Anybody who has visited the paintings galleries at the Kunsthistorisches Museum, Vienna, is familiar with the phenomenon: people clustered around the works of Pieter Bruegel, peering and talking and (to the guards’ annoyance) pointing excitedly to one detail or another. This is as it should be. In the artist’s lifetime (c.1525/30–69), his patrons in Antwerp hung his pictures on the walls of their dining rooms to provoke table talk; a generation later, Karel van Mander reported that it was quite impossible for even the most solemn person to look at the artist’s works without laughing.1 Even paintings whose key register is serious or tragic contain moments of humour – perhaps a comically exaggerated facial expression or an awkward posture. 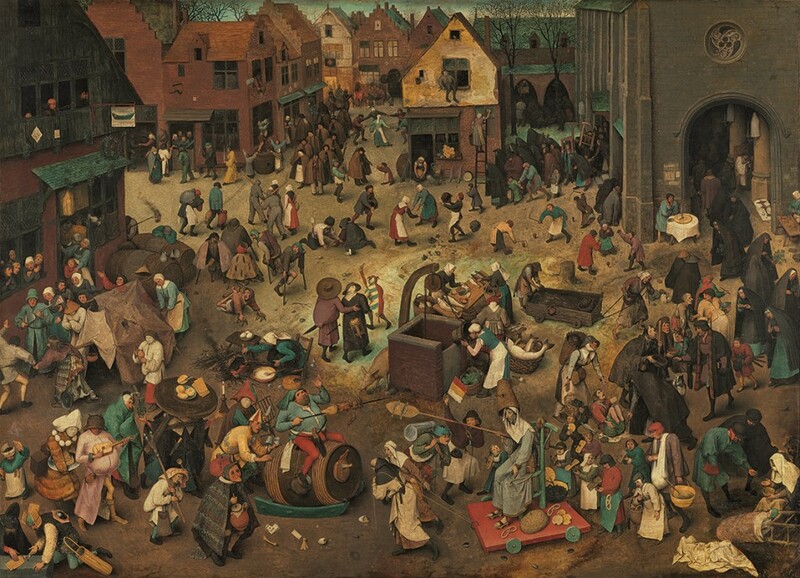 The play between how we experience these witty details and the very different effect of the scene as a whole is part of the fascination of Bruegel’s works. The injunction to look closely, and then more closely still, is one of the key themes of the exhibition under review. This is, remarkably, the first ever devoted to all aspects of the artist’s work. There have been shows of his graphic work, most recently at the Albertina, Vienna, and a fine selection of drawings included there reappear in the present exhibition. 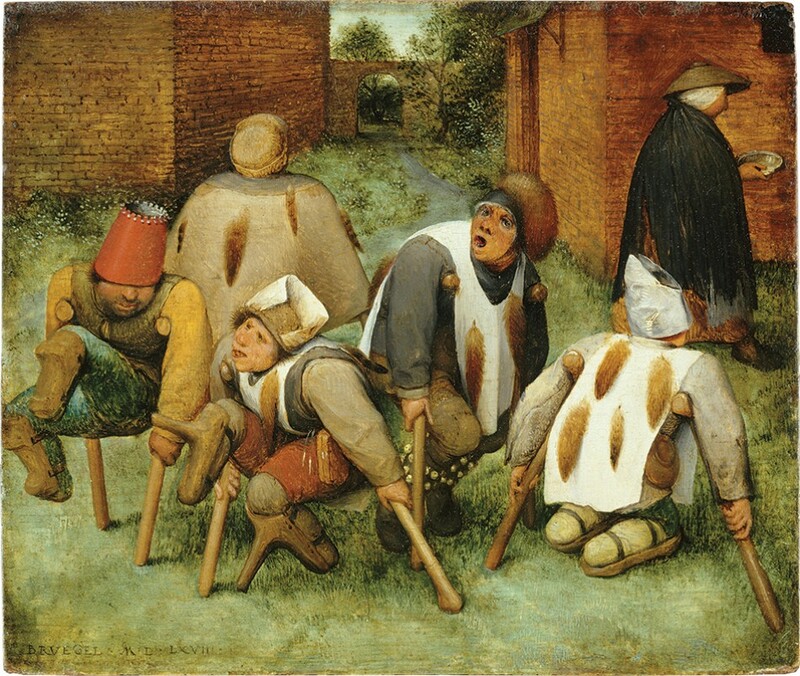 But Bruegel’s paintings are mostly on panel and difficult to transport. Moreover, every one is a unique treasure, a star of whichever museum owns it. Only the Kunsthistorisches Museum could have put together a show like this because their own Bruegel collection is so significant: a dozen works on panel, nearly a quarter of the whole oeuvre, including many of the most famous, provide a natural centre around which loans can be gathered and made resonant. Key moments of the exhibition are staged to take advantage of this fact. For instance, Haymaking from the Lobkowicz Collections, Prague (cat. no.73; Fig.15), hangs on a long wall among the Kunsthistorisches Museum’s three paintings from the same series of the seasons, so that we can sense the colour harmonies Bruegel was intending to produce when all of the six that he painted encircled a single room in the home of the Antwerp collector Nicolaes Jongelinck.2 Seeing the four pictures together allows us to take stock of how Bruegel works with different levels of detail. The early summer Haymaking is like Hunters in the snow (1565; no.75) in its close attention to a range of human activities, built structures and minute landscape features. It forces the eye to wander over every inch of its surface, pausing at the tiny archery contest on a village green or at the great rock at the left that is so alive with human movement. The two other Vienna paintings, representing late winter (1565; no.72) and autumn (1565; no.74), are less obsessively detailed, allowing for an easier, more generalising viewing. The display prompts us to ask whether Bruegel was thinking about the nature of light at these times of year or about the room for which the pictures were intended. Likewise, the Tower of Babel (after 1563(? ); Museum Boijmans Van Beuningen, Rotterdam; no.64) is dark and ominous when seen alongside the Kunsthistorisches Museum’s larger, brighter version of the theme (1563; no.63). The Rotterdam painting feels tight, unyielding, almost cruel, while the Vienna painting is brash, bold, almost celebratory. The curators have positioned the Vienna Babel as the show’s culmination, introducing it in the opening room by a vastly magnified detail of King Nimrod and his attendants, where the almost caricatural comedy of their faces delights and intrigues. Details of the tower itself are projected on a screen, alerting visitors to the fact that what seems like simply a huge building will be, like those rocks in the Haymaking, alive with infinite activities – of mining, of building but also simply of living, as workers’ families move in to occupy finished portions of the tower, turning its hyperbolic grandeur into just another apartment block. In the final room, people crowd around the two versions of the Tower of Babel to discover this for themselves as they laugh and point. See the man shitting? The laundry hanging in one arch? This room is devoted to close looking and cleverly emphasises how differently Bruegel’s works structure intense visual engagement. For instance, the newly cleaned Suicide of Saul (1562; no.57) offers a vast army locked in battle, hundreds of men fighting fiercely, but the only two faces we can read are the agonised Saul and his armourbearer as they fall upon their swords. The landscape is rich and enticing, its overall beauty forming an unsettling contrast to human slaughter. Hanging on the same wall is Beggars (no.85; Fig.16). The painting is tiny, and unexpectedly un-funny. Although the men it depicts are dressed in fanciful costumes and performing a dance to ask for charity, these lepers are terrible creatures, maimed and distorted by the disease that will eventually kill them. Because the picture is so small, it demands that we come close – too close for comfort. We have to focus on things we would prefer to avoid. Specialists will notice the exhibition’s absences even as they are excited by what has been brought together. Every painting by Pieter Bruegel is resolutely, almost madly, unique, yet ideas vary about how they interconnect with each other. The missing Census at Bethlehem (1566; Royal Museums of Fine Arts of Belgium, Brussels) would have been so well paired with the Adoration of the Magi in the snow (1563; no.65), which is making its first journey out of the Oskar Reinhart Collection, Winterthur, in nearly a century. Interestingly that Adoration is instead hung with the Adoration of the Magi from the National Gallery, London (1564; no.66), in which Christ is central whereas in the Winterthur picture he is almost lost at the edge of a busy village. Because the Fall of the rebel angels (1562; Royal Museum of Fine Art of Belgium) also did not come from Brussels, there is no section of the show about Bruegel as a ‘second Bosch’. So Dulle Griet (1563; Museum Mayer van den Bergh, Antwerp; no.61) is instead displayed alongside the Triumph of Death (Probably after 1562; Museo Nacional del Prado, Madrid; no.60) in the room on religious paintings, not the context in which they might normally be considered. Yet both are visions of an apocalypse, and the hang lets us consider how Bruegel saw an earth fully consumed by catastrophe. Both works are newly cleaned, and their brighter colours and clearer sense of spatial depth give a true sense of place – Dulle Griet extending fire and chaos throughout a deep landscape, Triumph of Death playing up the contrast between foreground richness and encroaching desolation. Even in death’s domain there are moments of hilarity, like the masked skeleton emptying a wine cooler while another, in fool’s garb, serves up a skull as dessert. You just have to look very hard to find those tiny details of humour within the horror. 1 K. van Mander: Den Grondt der Edel vry Schilder-const, trans. H. Miedema, Utrecht 1973, p.190. On dinner parties, see C. Goldstein: Pieter Bruegel and the Culture of the Early Modern Dinner Party, Farnham and Burlington VT 2013. 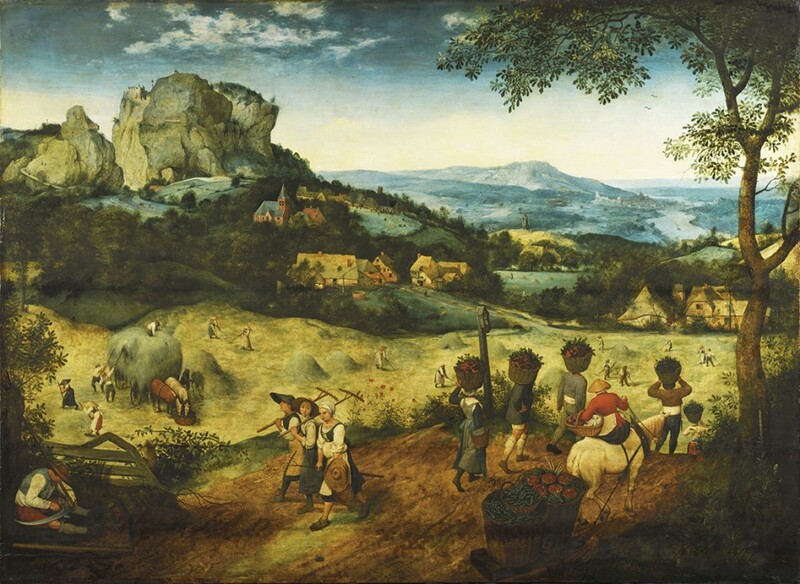 2 Harvesters (1565), in the Metropolitan Museum of Art, New York, has not been lent and the panel representing spring has been lost since the seventeenth century. 3 A. Benali, A. van Dongen, K. Lichtert, S. Pénot and L. Timmermans: Conversation Pieces: The World of Bruegel, Veurne 2018. 4 Catalogue: Bruegel: The Master. Edited by Sabine Haag, with contributions by Elke Oberthaler, Sabine Pénot, Manfred Sellink and Ron Spronk. 304 pp. incl. 320 col. ills. (Thames & Hudson, London, 2018), £42. ISBN 978–0–500–23984–1. The catalogue includes a code that allows it to be downloaded as an e-book or PDF from the Kunsthistorisches Museum’s website.